Born in Kobe. Given name Hideo. Father of Kawanishi Yuzaburo. First inspired to make prints by Yamamoto Kanae’s Small Bay of Brittany which he saw in a shop window. Graduated in 1915 from Kobe business school. Worked as postmaster in a small branch office in his home so that he would have time to make prints. 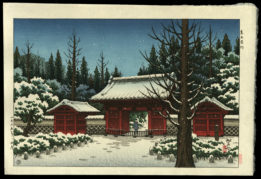 Exhibited with Nihon Sosaku-Hanga Kyokai from 1923, with Kokugakai from 1931, and at yearly solo exhibitions. Became member of Nihon Hanga Kyokai in 1932 and Kokugakai in 1935. Represented in Lugano in 1956. Contributed to Han, Han geijutsu, Taishu hanga, HANGA, Kasuri, and Kitsutsuki. His prints, usually executed in large areas of strong color and without lines, relate to life in Kobe. Among his works are Twelve Customs of Showa Beauties (Showa bijin fuzoku junitai), 1929, published by Sawada Ishiro, Kobe Scenes in the Twelve Months (Kobe junikagetsu fukei), 1931, Scenery of Kobe (Kobe fubutsu), 1933-1935, One Hundred Kobe Prints (Hanga Kobe hyakkei), 1935, an invaluable record of the city’s architecture and flavor at that time, Scenes from a Port Town, 1941 (10 prints), and One Hundred Views of Kobe (Kobe hyakkei), 1962. Awarded Hyogo Prefecture Culture Prize in 1949 and Kobe shinbun Peace Prize in 1962. ** Taken in whole, or in part, with permission from: Merritt, Helen and Nanako Yamada. Guide to Modern Japanese Woodblock Prints: 1900-1975. University of Hawaii Press: Honolulu. 1992.